An advanced treatment septic system in Springfield, MO may be required by Greene county due to limiting soil conditions or available room. How is it different from a standard septic system? A standard system relies primarily on treatment from anaerobic bacteria alone. 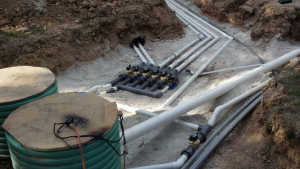 For a look at other types of systems check out Conventional Septic System Installation in Springfield, MO. An advanced treatment septic system has additional components that treat the effluent (liquid part of sewage) to a higher level of purity before releasing it into the soil for final disposal. This higher level of treatment is accomplished by introducing aerobic bacteria into the system. This is usually done through proprietary systems that involve aeration or recirculating media filters of various configurations. Two advantages of an advanced treatment system are that the effluent it produces contains fewer pathogens and it has less tendency of clogging soil particles than a standard system. Advanced treatment systems and standard versions both utilize the soil for final disposal in most instances. A naturally occurring substance called a biomat is formed where anaerobic effluent meets the soil. It is a result of the anaerobic effluent reacting with the soil. The biomat serves to reduce sludge and pathogens. However, when it develops into a layer thick enough to slow or stop the absorption of effluent into the soil it quickly becomes a problem causing system backups or surfacing effluent. Advanced treatment systems help lower the chances of having too thick of a biomat forming by introducing aerobic bacteria into the system. Let our technicians at Envirotek Systems determine the right solution for your next advanced treatment septic system in Springfield, MO.